A better-than-expected reading on the job market propelled stocks to their fourth straight day of gains, putting a bullish stamp on the first few days of September trading after the worst month of August for U.S. equities in nearly a decade. 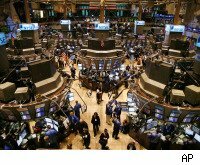 The Dow Jones Industrial Average ($INDU) rose 128 points, or 1.2%, to close at 10,448. The blue-chip index gained nearly 3% on the week, breaking a three-week losing streak that saw it close below 10,000 for the first time since early summer. Investors cheered the second surprisingly good reading on the state of the economy in as many days. The mother-of-all monthly releases -- the jobs report -- showed that the private sector added 67,000 jobs in August, the Labor Department said, or more than the 40,000 increase economists were expecting. True, the nation shed 54,000 jobs last month, but economists and the market were anticipating a number nearly twice that high. Friday's encouraging jobs report follows yesterday's surprisingly strong reading on U.S. manufacturing by the Institute for Supply Management. The ISM'spurchasing managers index, a closely watched gauge of business activity, increased to 56.3 in August from 55.5 in July. Economists, on average, were looking for the index to fall to about 53. A reading above 50 means business activity is expanding. Kenny Polcari, managing director at interdealer broker ICAP Corporates, tells DailyFinance's Nikhil Hutheesing the ISM and unemployment data were just what the market needed after staggering out of August. "At the beginning of the week it felt like the economy was going into a tailspin and all the talk of the double-dip recession," Polcari says. "And we ended up getting some positive [economic] news at the end of the week, specifically today's great news on the jobs picture, and we're getting nice relief rally."